Needless to say I still manage to spend time the ‘puter, on supposedly less time consuming exploits. Reading articles online, and even facebooking and tweeting don’t leave quite as much of a (time-wasting) evidence trail as a meaty blog post, if you know what I mean. I know I have a bit of an addiction (but at least it’s a well-read, well-educated one!- particularly with all the election palava going on at the moment.) I’ve also been doing P & C minutes, and stuff for the netball. It’s very easy to get waylaid with it all. Last week got waylaid by two days in the school canteen – one of which was a whole day to fill in for a very unwell paid supervisor. I muddled through that day, thankfully with help from other volunteers who stepped up, and at the end of it wondered how the hell mums who work do it. I was bloody exhausted. This week things are quieter . Well, except that yesterday I had to drive Ms 17 into town to organise for her HSC art major works to be mounted, and there was the shopping to do… BUT I allocated (in my mind) today to clean, or to paint verandah joists, as necessary. Himself has been making practical inroads with Project Renovation, while my input has been more of a ‘holderer’ of ladders and tools and tape measures, and a ‘passer-upperer’ of said tools. And getting on the phone to hassle plumbers for quotes, and to order decking timber, and to get quotes for this, that and the other. None of which screams ‘accomplishment’ when you stand back and look for evidence of what you’ve done all week. So this morning Himself expressed some concern as to my ability to set myself up to paint. (I’d like to think there was some consideration in there for a recalcitrant shoulder/upper arm too… but I’m not so sure.) He ran around finding an old billy to decant paint into – but then expressed doubt as to my ability to decant said paint from the 4 litre can. So I said that I could quite easily spend the whole day vacuuming. Three floors of a house well, well overdue. He agreed that that might be a good idea. And THEN he suggested that I wash the van as well. Any wonder I’ve got that song playing in my head right now. “Now don’t I let you wash the car on Sunday? So on Saturday we went speed dating – and did our ‘civilised’ ride into town to meet up with the earlybird (6.30am) Community Ride cyclists at 8.00 when they arrive back at the mall for coffee. Our ‘date’ is to ride 23km into town, have coffee, a bite to eat, and a chat, and then ride the 23km back home up the highway again – just in time for Himself to drive the girls to netball. Unfortunately, part and parcel of being a cyclist who rides any distance is that you cop abuse from motorists who don’t know the road rules. An experience on the weekend leads me to beg all road users to refresh their knowledge of their road rules. Like it or not, bicycles are classed as vehicles, and as such are actually allowed to be on the road. Blowing your horn and yelling abuse to a slower moving vehicle in the lane in front of you, but following the road rules appropriately, is actually not ok.
Local business owners in particular might like to take the opportunity to ensure that their employees are up to speed with their road rule knowledge. On Saturday morning my husband and I were riding our tandem in town, obeying the road rules as we waited at the lights at [.. a major intersection], and then headed north on the highway. In the short distance under the railway bridge, we were ‘honked’ and then abused by the occupants of a truck carrying the identification of a local company, simply because we were on the road. Karma is a strange thing. We are about to start major house renovations. Guess which company will now not be given an opportunity to quote on a significant supply and fix job? And guess which company name will inevitably be mentioned when we share that particular experience with friends and fellow cyclists? And guess which truck just so happened to end up parked just up the road from our house later that morning? My husband took the opportunity to let the driver know that his knowledge of the road rules needs updating. (The passenger responsible for the verbal abuse also did not know that you are only allowed to ride your bike on the footpath – where he thought we should have been – if you are under 12 or supervising an under-12). I am still trying to decide whether to let the business owner know as well. Before receiving a tirade of letter abuse in response, I would add that, just as a percentage of motor vehicle drivers do the wrong thing on the road, I acknowledge that there are indeed cyclists who give the rest of us a bad name by doing the wrong thing on the roads. As a motorist AND cyclist, I’ll get cranky with either! I would also acknowledge that when we are riding we also experience some great courtesy from drivers. A big thank you to all those trucks and cars who do give riders some room and some breathing space. 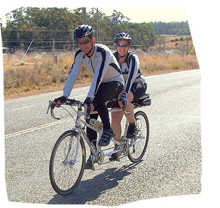 A quick Google of ‘nsw road rules bicycles’ and a read through the Bicycle Safety section of the RTA road safety information is recommended reading for all of us who use the roads. I just sent a copy to my friend who works in the smaller local paper. Maybe I’ll get some mileage out of it. If I can enlighten a handful of people about the actual road rules, then I will have achieved something. I just wish I’d been a fly on the wall of the car when Himself spotted the exact same truck in our street. He was.. what can I say .. not aggressive.. but .. ‘firm’. And I think he may have left him stewing about whether I am going to ring his boss! But what are the chances of seeing that exact truck a couple of hours later – in our street?! That’s what I call karma. Filed under miscellaneous minutiae, on yer bike, what the??? Well, there you go. You learn something every day – and in fact one day was all it took to get a response from the Museum Victoria’s Discovery Centre. How impressive is that? They also sent me a pdf attachment, but in the interests of being able to link, now that I know what I’m looking for, I’ve been able to google away merrily. Sand collars are the egg masses of certain sea snails, marine gastropod mollusks in the family Naticidae, sometimes known as “moon snails”. These egg masses often wash up on sandy beaches, either whole or sometimes in fragments. When they are whole, sand collars are shaped like an old-fashioned detachable shirt or blouse collar (hence the name). They consist of sand grains cemented together by a gelatinous matrix, with embedded eggs. A fresh sand collar feels stiff and yet flexible, as if it were made out of plastic. Each sand collar contains thousands of capsules, each one housing one or several live embryos. In species with planktonic development, these embryos hatch out as bilobed veligers. After the eggs hatch, the sand collar disintegrates. If you google image search ‘sand collar’, you’ll get more info than you can poke a stick at! Obviously I was holding a lot more than I bargained for in my hand! And so… what to do with the prize I offered… ? Noone actually got the answer as such, however Jayne, whose “Feral Beast” nearly had it.. and Jen who also suggested shark egg cases,both set me off on a non-seaweed research track. So, Girls! I can offer each of you a 6 x 8 inch print of any of my photos that you choose, or a full resolution digital copy of a photo of your choice (resized to whatever dimension you prefer) that you can use for your wallpaper. Email me (see my About page) and we’ll sort it out. Thanks for being part of my very first competition! Ms 17, as you might deduce, is obsessed with all things Dr Who. If I can’t give you words, well … I can give you images. Beach images. Of course. With low tide coinciding with late afternoon at the moment, it’s definitely my favourite time for doing my beach walk thing. Naturally after not taking my camera the other afternoon (whereupon I was going *click, click, click* in my head with all these perfect ‘mind’s eye’ shots), yesterday afternoon, camera clutched in my hand I was struggling. Come to think of it, I was out a bit earlier than the other afternoon. You have to time it properly – till the setting sun brings out that exquisite pastel pallette. I see them all the time on the beach, and they always looks to me like man-made rubbery things. Like broken rubbery.. seals; and often there are loads of them washed up on the beach. In the interests of investigation, this time I picked up one to look more closely at it. Just for you of course! Hmmm. Perhaps they aren’t rubber after all. It looks distinctly seaweedy to me. As for what sort it is, I have no idea, and right now, with my ginormous list of Things To Do, skiving off on a Google seaweed search isn’t even on the front page, never mind near the top. That’s a long shot I know. But if someone comes through with the research, I promise to put my money where my mouth is! With visions like this on my beach on many an afternoon, heaven knows why I don’t make it down there every day. I suppose I might just get blasé about it. My conscience tells me I shouldn’t spend time blogging (I can easily lose a whole morning writing a single post) – yet I spend the same amount of time surfing aimlessly between Tweetdeck, Facebook, blogs, the news, and my favourite time-wasting sites. This lack of direction probably reflects everything in my life right now. Like blog, like life – I’m lacking a theme, and a sense of purpose. Maybe it’s the netball fatigue. By the weekend I finally caught up – and then Himself and I dusted off the tandem (actually – he did that, after having taken it in to the bike shop recently to get something fixed on it) – and we did our first tandem ride in more than 6 months. His idea of easing back into it was a 35km ride down the highway and back. Apart from the chestiness (new medical term I just made up to describe the lingering chesty cough feeling in my lungs), I was actually surprised at how I pulled up. Now we just have to make it a regular thing again. Next project now is to get a handle on starting the renovations/extensions. I’m dropping off the Owner Builder permit application to Fair Trading today. I made a start on trying to clear out some junk on the weekend. But I think Himself needs to take a week or two off work to get the ball rolling. Yesterday afternoon I went for a walk on the beach. It’s criminal how long it has been since I’ve done that. I didn’t take the camera, and of course wished that I had. There’s a potential photographer hiding deep down within me – she just doesn’t know how to get out. Right now I’m off to take Ms 11 and friend to the movies. Toy Story 3. I could do without seeing it in 3D, but they insist. Regular transmission may resume again soon – once I find my writing mojo amongst the mess. Perhaps I need to go out and buy a new direction. Any idea where they sell those?